A beautiful and contemporary modern home set upon a spacious plot of approximately 0.43 acres and positioned on the fringe of this sought after Wolds village. The living spaces are flexible and well proportioned and include a stunning living-kitchen diner and impressive main living room which can be fully open to the pool area. There are further reception spaces and two storey hall with bespoke staircase and gallery above which provides an remarkable entrance. On the first floor there are no less than five en-suite bedrooms with the master suite having a delightful balcony overlooking the pool area and gardens. The extensive driveway provides ample parking and there are detached and integral double garages plus heated swimming pool and landscaped grounds. General Information - Willloughby is a popular village situated approximately equidistant to Leicester and Nottingham centres and close to the A46. The village offers easy access to the nearby university/market towns of Loughborough and Melton Mowbray and has a range of facilities including primary school (rated outstanding in 2017) village hall and playgroup, park with play area and sports pitch plus village bowls club, Church and many other clubs and societies. Commuting - The property is well placed for commuting both regionally and nationally with nearby Loughborough Station offering mainline links to London St Pancras in approximately 1hr 20 minutes. Road links are equally well catered for with the A46, M1, A/M42 and even the A1 all within easy reach. East Midlands International airport is only 15 miles away and access to the cities of Leicester, Nottingham, Derby and Birmingham plus Loughborough and Melton Mowbray is available within an hour or so. Epc Rating - An EPC Assessment has been carried out on this property with the resulting rating C. For a copy of the full report visit www.EPCRegister.com and search for the property using the postcode. The Property - Well set back from Main Street, the property has been completely redeveloped by the present owners with huge attention to detail with the aim of creating a family home that really works on a day to day basis and offers the rare combination of wow factor. The fantastic specification includes a heat-recovery ventilation system, zoned heating, CCTV and photovoltaic panels, Cat 5 cabling, programmable light scheme, underfloor heating (ground floor) central speaker system and more. Entrance Hall - 7.64m x 2.78m (25'1" x 9'1") - An impressive full height space with feature chandelier and bespoke curved staircase rising to the first floor. Snug/Family Room - 3.33m x 3.20m (10'11" x 10'6") - A flexible room which faces the front elevation - ideal as a playroom or snug sitting room. Ground Floor W/C - With two piece contemporary suite and cloaks space. Living/Dining Kitchen - 6.91m x 6.83m max (22'8" x 22'5" max) - With open plan spaces including kitchen area with chefs/breakfast island and formal dining plus seating areas with dual aspect to front and rear plus a selection of quality Siemens appliances including coffee maker, self cleaning oven, steam oven and dishwasher. There are black Quartzite counter-tops and fully opening bi-fold three panel doors to front and rear opening o the BBQ patio and pool area respectively. Sitting Room - 8.26m x 4.88m (27'1" x 16'0") - This room is perhaps the show piece of the house with floor to ceil sliding doors with electrically operated blinds which fully retract to allow complete integration with the pool area outside. Additionally there is a bar area with multi-media centre for entertaining. Utility Room - 5.95m x 2.9m max (19'6" x 9'6" max) - With ample storage and access to the boot room, office and integrated garage. Office/Study - 3.47m x 2.10m (11'5" x 6'11") - Tucked away at the rear of the house this home office is a useful space that can be shut away out of sight/mind in the evening. Boot Room - With external door to the property's rear garden. Gallery Landing - 7.06m x 2.72m minimum (23'2" x 8'11" minimum) - With stunning feature chandelier over the two storey space and curved handrail matching the staircase. Master Bedroom - 7.15m max x 5.31m (23'5" max x 17'5") - With initial corridor/wardrobe area and integrated vanity unit plus access off to the luxury en-suite bathroom and sliding patio doors with electric blinds accessing the full width balcony which overlooks the garden and pool area. 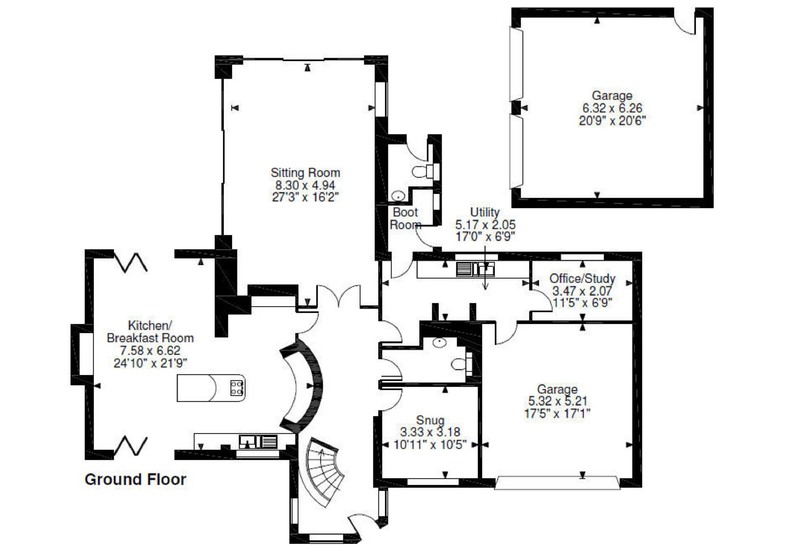 Master En-Suite - 3.06m x 2.54m min (10'0" x 8'4" min) - With five piece suite and two level layout including sunken jacuzzi bath, walk in shower, WC and twin wash-basins plus programmable lighting and backlit LED mirrors. 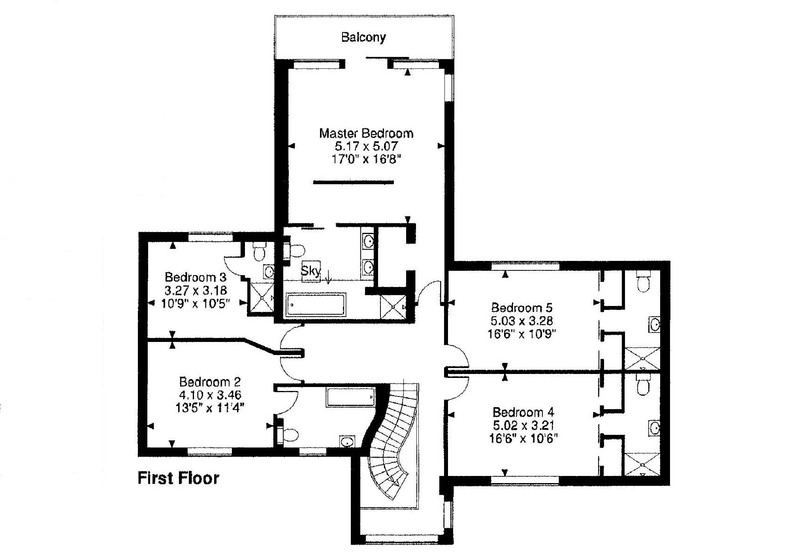 En-Suite Bathroom - 2.53m x 2.01m (8'4" x 6'7") - With full bath suite and shower over. En-Suite Shower Room - 2.31m x 1.24m (7'7" x 4'1") - With contemporary three piece suite. En-Suite Shower Room - 3.29m x 1.25m min (10'10" x 4'1" min) - With contemporary three piece suite and front elevation aspect. En-Suite Shower Room - 3.28m x 1.21m min (10'9" x 4'0" min) - With contemporary three piece suite and rear elevation aspect. External Buildings - The property offers both detached and integrated double garages with twin and single access doors and measurements of 6.32m x 6.26m and 5.32 x 5.21m respectively plus an external WC to the rear elevation close to the pool area. Gardens - The property offers a variety of outside spaces with walled south facing BBQ patio to the front elevation with Mediterranean style planting. The rear garden is flat and level with heated swimming pool which has a walk-on thermally insulated electrically retractable cover and spacious surround for lounging with decking, lighting and external speaker system. The remainder of the gardens is laid to a substantial lawn and backs onto open fields and the Willoughby Millennium Woodland.